Sewanee's Sustainability Fellows took a late-fall road trip to the city of Asheville, North Carolina. Read about their adventure through the eyes of Luke Williamson, C'21. The Sustainability Fellows, Sewanee students who develop projects with the goal of building and developing sustainability projects on campus, went to Asheville, North Carolina, last fall for a three-day trip filled with networking, peer-university interaction, and learning opportunities. 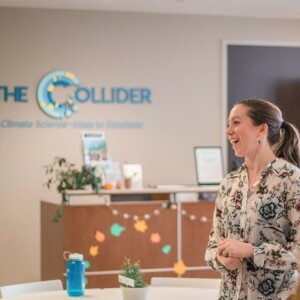 While there, the Fellows met with peers at UNC-Asheville, took an electric bike tour, and visited the Collider, an entrepreneurship and innovation center dedicated to building startups that use data—climate, environmental, and socio-economic—to help the world deal with intensifying climate change. See the full report from one of the Fellows.